In the fall of 1979, the Bairs-Hostetter congregation requested a transfer from the Lancaster Conference to the Mid-Atlantic Mennonite Fellowship (MAMF). This request was granted in the spring of 1980. For the joint history of the Bair-Hostetter-Hanover fellowship see Bairs-Hostetters Mennonite Church (Littlestown, Pennsylvania, USA). Landis, Ira D. "Bair Mennonite Meetinghouse (Spring Grove, Pennsylvania, USA)." Global Anabaptist Mennonite Encyclopedia Online. 1955. Web. 23 Apr 2019. http://gameo.org/index.php?title=Bair_Mennonite_Meetinghouse_(Spring_Grove,_Pennsylvania,_USA)&oldid=163330. Landis, Ira D. (1955). Bair Mennonite Meetinghouse (Spring Grove, Pennsylvania, USA). Global Anabaptist Mennonite Encyclopedia Online. 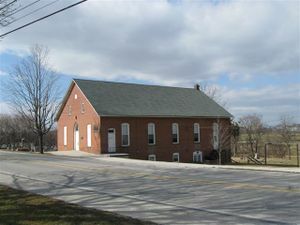 Retrieved 23 April 2019, from http://gameo.org/index.php?title=Bair_Mennonite_Meetinghouse_(Spring_Grove,_Pennsylvania,_USA)&oldid=163330. Adapted by permission of Herald Press, Harrisonburg, Virginia, from Mennonite Encyclopedia, Vol. 1, p. 214. All rights reserved. This page was last modified on 24 February 2019, at 13:06.